Architecture practice Gensler and footwear giant Reebok have revealed a concept to convert American petrol stations into fitness centres that generate energy. 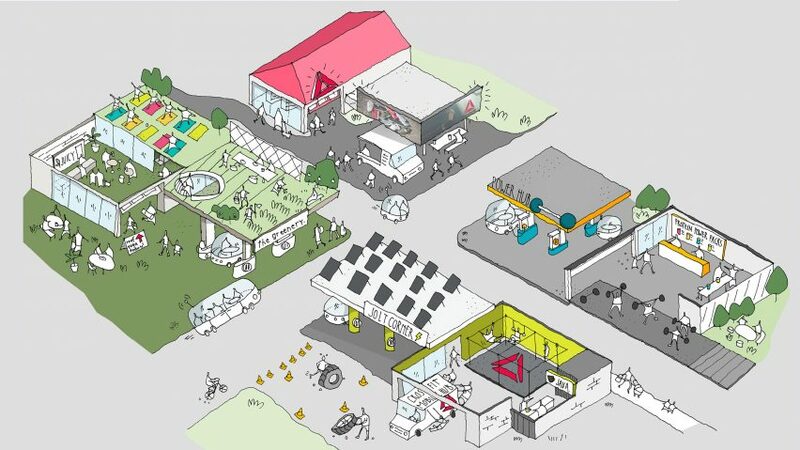 With the goal of creating a country where a gym and restaurant are always within a few miles away, the concept focuses on three different types of US gas stations. "Each concept is tailored to a different type of gas station in a unique setting, allowing people in locations from rural America to urban cities the opportunity to get fit and eat healthy," Arlyn Vogelmann, a principal at Gensler's Boston office, told Dezeen. The proposal envisions interstate rest stops as the "power grid of the future", a place where travelers can stop and generate energy by exercising. Larger gas stations on local highways would be converted into "recharge zones", with farm-to-table restaurants, juice bars and meditation pods. Finally petrol stations in local towns, would be turned into community shops and electric charging ports. The partnership came about following Gensler's recent completion of the Reebok headquarters in Boston's Seaport district, which includes a 2,800-square-metre fitness centre. "At the close of the project, Reebok came to us with the idea of repurposing gas stations into on-the-go fitness centers," said Vogelmann. "Intrigued by the concept and inspired by the health and wellness focus that had driven the design of the headquarters, the design team immediately got to work developing a strategy and visual sketches for how we envision the urban gym of the future." Although the project began as an "interesting concept with fun illustrations", Gensler and Reebok are exploring implementation by considering a number of pilots and partners that could make the concept a reality. "There would be a lot of stakeholders involved to make this a reality, like highway transit organisations and local and federal governments," Vogelmann said. "We work with a number of large-scale transportation clients, from ExxonMobil to airports, who could help move it along." "While it's still very much in the conceptual stage, we are optimistic that this project could evolve into a reality one day," she added. Gensler, the world's biggest architecture firm, has released several speculative projects in recent years. Among these, the company proposed relocating the UK parliament to a floating temporary building on London's River Thames, and suggested a replacement for the ill-fated Chicago Spire skyscraper.